Here’s some basic information on the benefits of stablecoins and how to get and use them on Binance. Binance is a pure cryptocurrency exchange, so we do not offer crypto-to-fiat exchange pairs on our main platform^. Because of this, we have received requests from many users for onramps to convert US dollars into tokens to trade on Binance. Stablecoins are an attractive solution to this. With stablecoins, you can exchange your US dollars into tokens listed on Binance. Stablecoins are expanding our “Exchange The World” mantra to new possibilities and opportunities. Stablecoins are cryptocurrencies designed to be pegged to a specific value, commonly fiat currency. 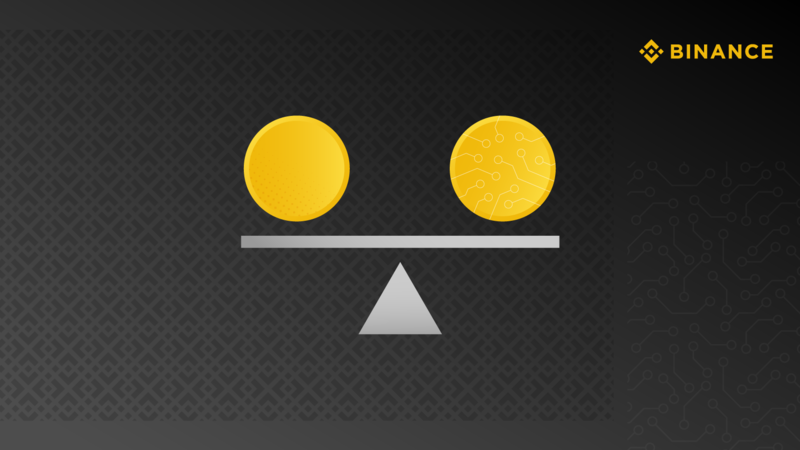 You gain one unit of a stablecoin when you exchange one unit of the fiat currency that the stablecoin is designed to pair with, and vice versa. Right now, there are more than 170 stablecoins in existence, according to blockchain news service BitDigest. A lot of the more well-known stablecoins at the moment are pegged to the US dollar, but there are also notable stablecoins that are pegged to other fiat currencies and even commodities like precious metals. Which Stablecoins Are on Binance? What Are the Benefits of Stablecoins? - Stablecoins listed on Binance are backed by US dollar on a 1:1 basis, so there is no uncertainty about the conversion rate. - There are minimal to no fees involved when converting US dollars to stablecoins and back. Most of the costs associated are in the wire transfer charges. In comparison, exchanges that deal with fiat often charge bigger fees for withdrawals into US dollars. - Transferring stablecoins between different exchanges is fast, traceable (can track the progress on the internet), cheap, and less volatile. Where Can I Buy Stablecoins? Among several stablecoins we have studied, the following coins have straightforward, trusted channels for converting fiat into stablecoins. How to Buy Crypto Using US Dollars via Stablecoins? Below, we provide a step-by-step guide on how to turn your US dollars into crypto through stablecoins and Binance. This process results in fewer fees for your transaction compared to many other onramps. Once you complete the account opening process, complete the verification processes on that website. Once the verification process clears you, wire US dollars from your bank account to the stablecoin company through the account provided on that website. You will receive your stablecoins once the wiring process is complete. Buy Bitcoin or other cryptocurrencies using the stablecoin you deposited on Binance. Wire fees that may vary depending on the bank. In some cases, these rates can be similar to or even lower than those on fiat exchanges. How to Turn Your Crypto Into USD via Stablecoins? Meanwhile, here’s a handy guide on how to get US dollars by trading your crypto. On Binance, convert your Bitcoin or other cryptos into the stablecoin of your choice. Convert your stablecoin to US dollars. When prompted on the website, or via other relevant means, have your stablecoin company wire the US dollars to your bank account. Binance stablecoin withdrawal fees, which usually range from US$0.80 to $1.50. These rates are at the low end when it comes to the crypto exchange industry. * This is just a general overview of the process of getting stablecoins using your US dollars. For more details on the process for each corresponding stablecoin, please see the FAQ pages of Paxos, TrueUSD, and USD Coin. For questions that pertain to transferring these stablecoins to and from Binance, please feel free to consult our Binance Support page. One More Thing: Stablecoins is the best option for converting fiat into crypto for trading on Binance because the exchange does not charge deposit fees for your stablecoin transactions. This will provide savings on your part compared to other methods of buying crypto with your US dollars. If you have more questions about how to leverage your US dollars into potential gains via crypto trading on Binance, you can explore our Binance Support page (for individual users), or email corporate@binance.com (for institutional investors) or tradedesk1@binance.com (for all users). Post-Script: TrueUSD has an insightful stablecoin code of ethics that you can read here: https://blog.trusttoken.com/the-stablecoin-code-of-ethics-93a7a5e198dd. Also, as with any transaction involving assets, please exercise due diligence and adequate security measures. ^ Of course, there are fiat-to-crypto platforms like Binance Uganda and Binance Jersey right now, but for our intents and purposes, we are doing this guide for those with fiat currencies that are not yet serviced by Binance-branded fiat-to-crypto platforms.